I missed Amphawa’s floating market on my last run through Thailand. Today I corrected that oversight and joined throngs of holidaying Bangkok citizens in a trek to the delta outside Bangkok. Today was the second day of a three-day Thai holiday. Monday, the country commemorates the day Buddha gave his first sermon outlining the tenants of the Buddhist religion. That’s tomorrow, though. Today, it seemed like half the urbanites were out for a quiet weekend in the country. Of course, when 500,000 people all go to the country, the country feels a whole lot like the city. 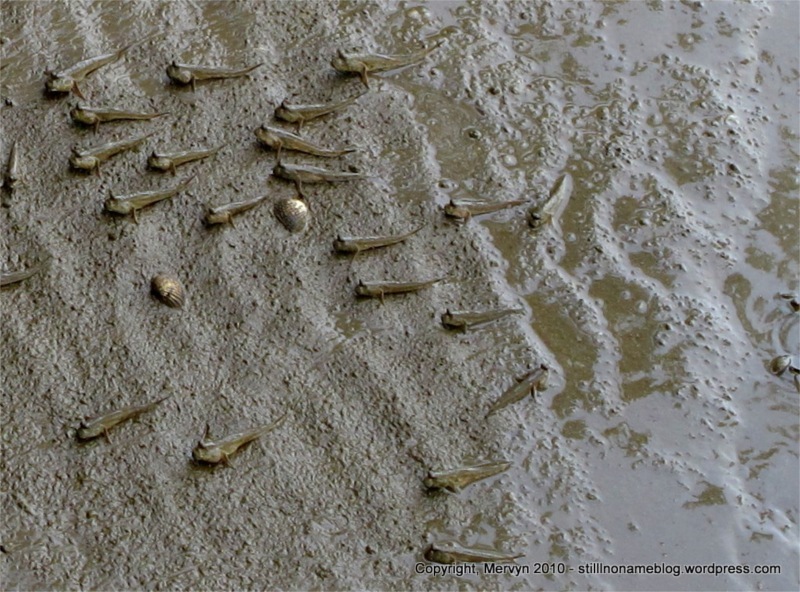 The traffic started when our car caravan hit a stretch of delta restaurants renowned for their seafood. We stopped for lunch and Fon, her friends, and I all piled out of our cars, shed our shoes, and settled around a low lying table at a crowded seafood restaurant. 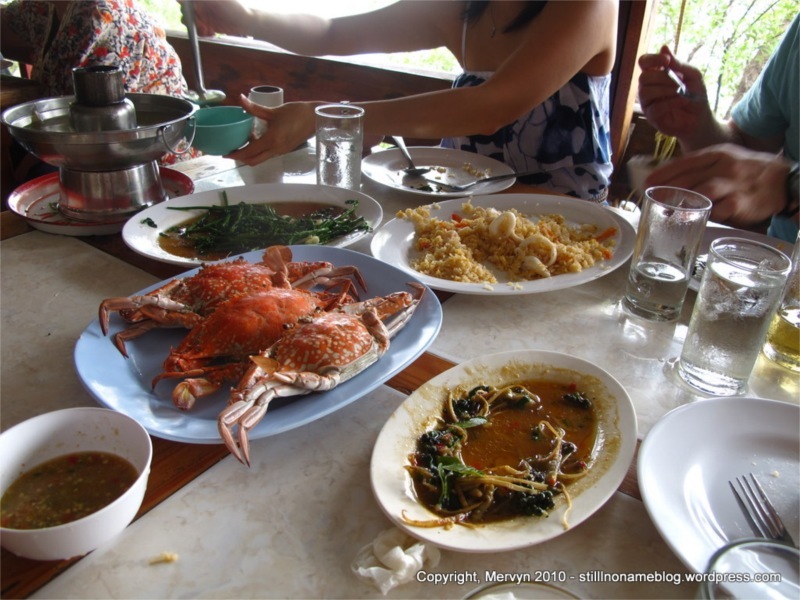 The table soon filled with various preparations of crab, vegetables, fish, and soup. Since this is Thailand, our meal was accompanied by an array of sauces. Everything was delicious, though I could have survived without the fish soup (too much work fighting through all the bones). We left our meal and joined a queue of cars headed for the resort town of Amphawa. 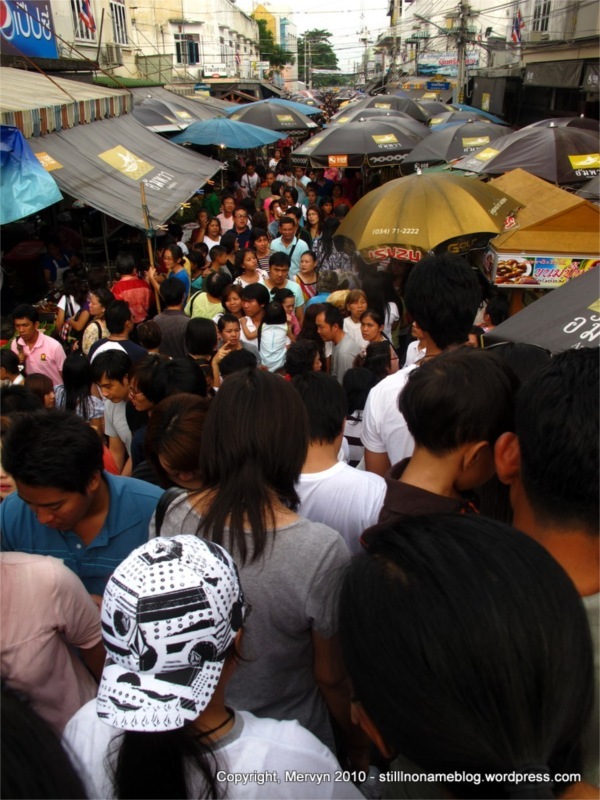 Traffic was so bad we parked a bit outside of town and walked the rest of the way in–down the edge of the river, through hordes of Thai tourists, rows of food stalls set up to make some long weekend money, and right smack into a sheltered tributary and its resident floating market. I’d been to the floating market in Can Tho, Vietnam. Amphawa’s is quite different. Can Tho’s is a wholesale market where farmers come to the city to sell their goods to retailers who float amongst the big boats trying to get the best price on beets, durian, guavas, lettuce, or whatever. Those retailers will bring the goods ashore and resell them at their own shops. 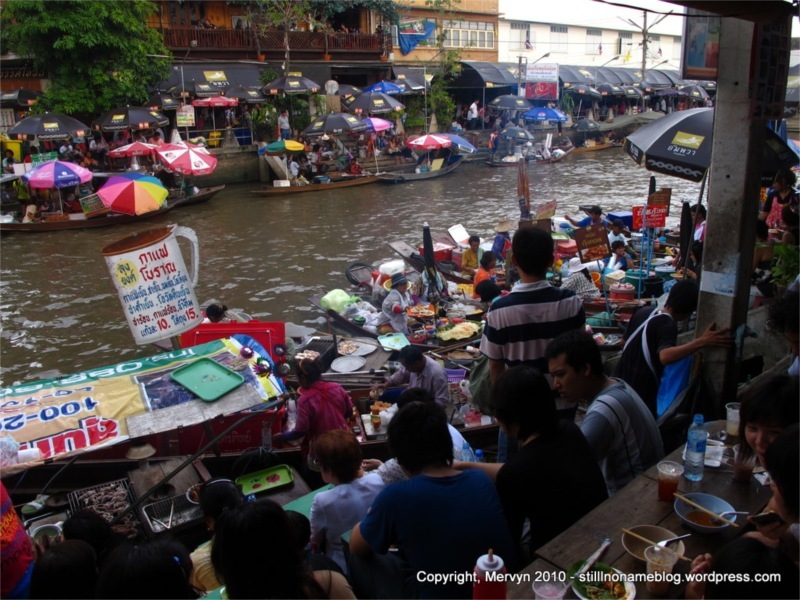 Amphawa’s market seems to be geared for retailers to sell to everyday customers. Everyone on a boat looked like they were selling prepared food. The ladies (mostly) on the boats would take orders from the shore, whip up a dish, then use long poles with plastic baskets on the end to pass the food up to a (usually) male assistant on shore. Some women would have their legs dangling in the water as they chopped vegetables, fried noodles, or fried up fish. One male boatman had a bustling little coffee shop going. The difference in markets makes sense. 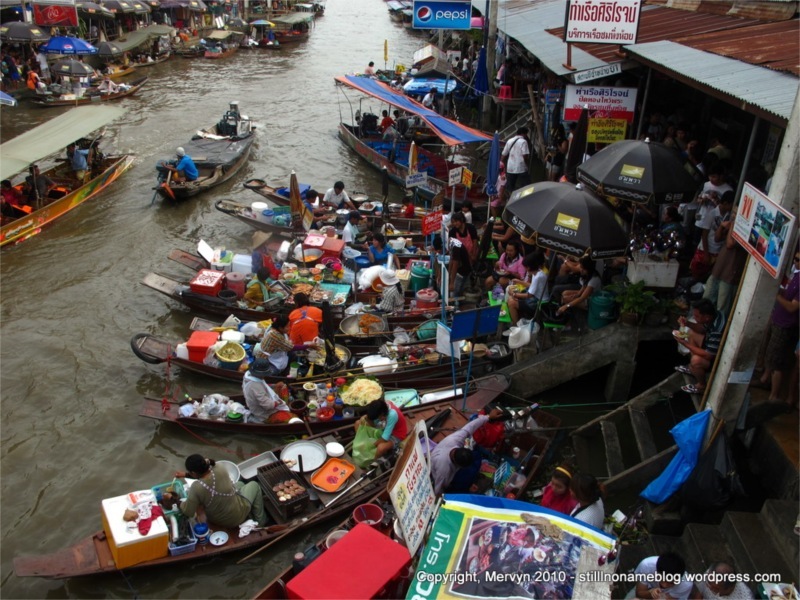 Unlike Can Tho, the market here is on a narrow part of the river. 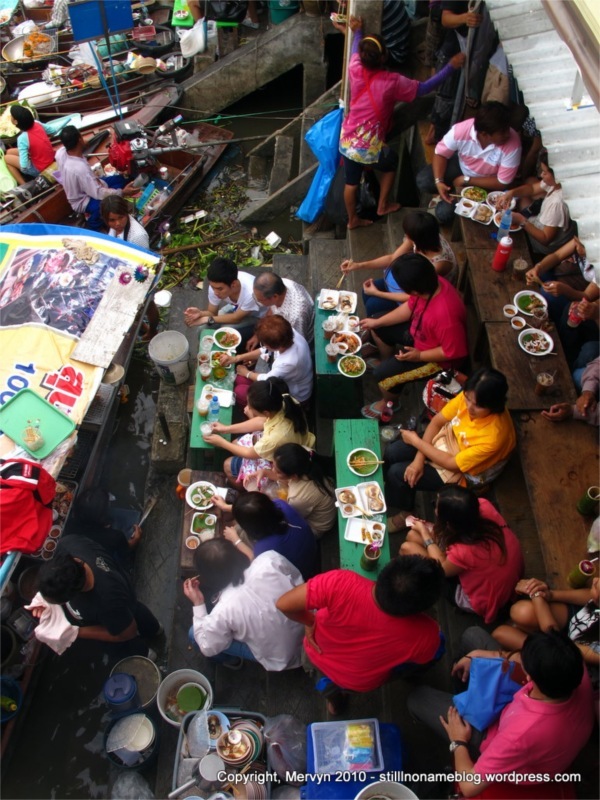 People live all up and down the banks, making it an ideal place for food sellers to hawk their fare. The river is the street and proprietors could slowly row past house after house, calling out what they were selling for the day. All someone would have to do is pop out their window and yell out what they wanted. Of course, Amphawa is a tourist town now, too. It’s geared towards Thais (I barely saw any Westerners), but it’s a resort town nonetheless. The sellers no doubt make most of their money off people from Bangkok on holiday. They can probably make more selling prepared meals rather than heads of cabbage. 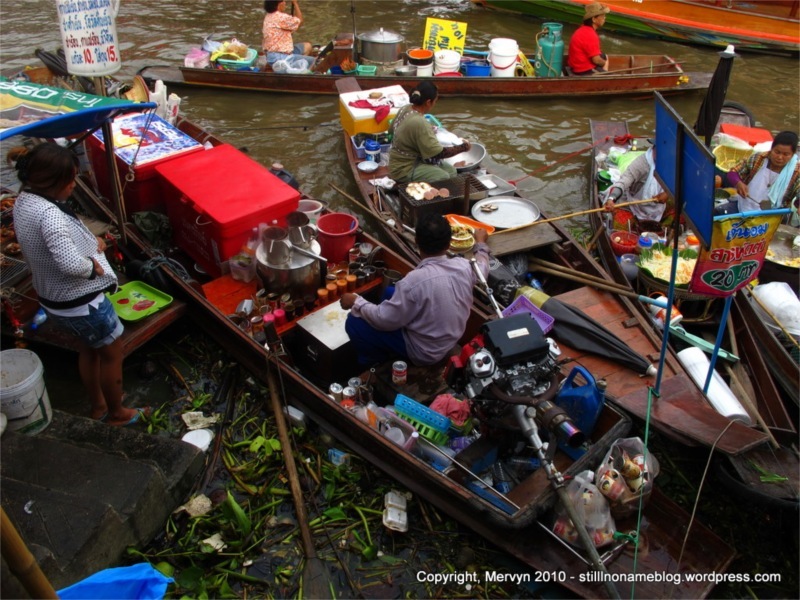 Amphawa isn’t just a floating market, though. Food stalls abound in the surrounding streets. 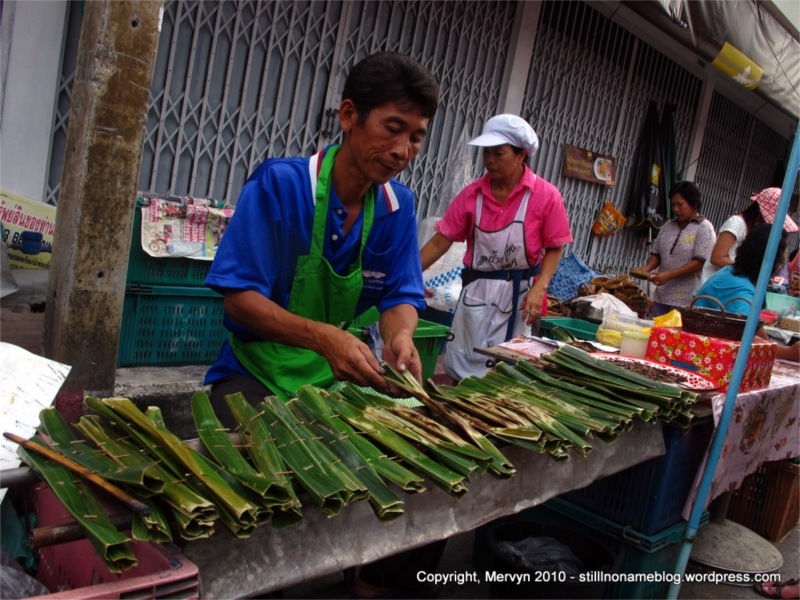 Lured by the smell of smoking banana, I grabbed a bite from a man grilling sticky rice, sugar, and coconut wrapped in banana leaf. The sticky, sweet, warm confection was just what I expected it to be. Yummy. 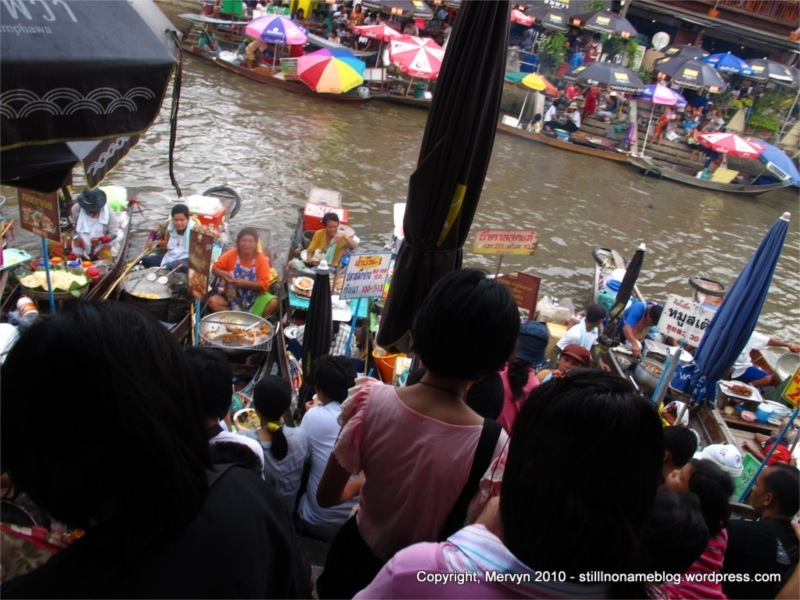 The crowds of vacationers couldn’t take away from the relaxed atmosphere surrounding the Amphawa floating market. Despite the call and response from boat to shore and the throngs of people, the place has a laidback, relaxed vibe. Perhaps it’s something about the presence of water. 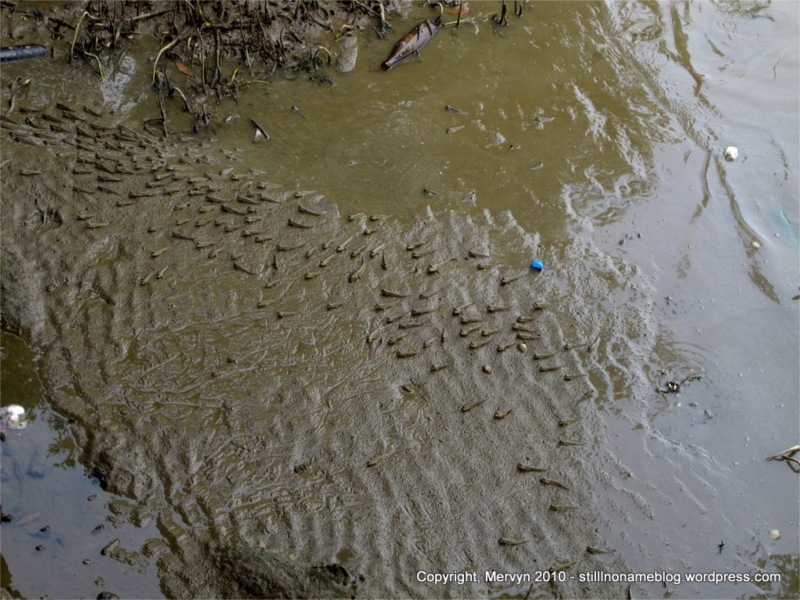 The slow-flowing river makes everything feel like it’s moving at half speed, even if all of Bangkok seems to be walking along its shores. Maybe it’s because people are buying and selling food. Something about eating makes things feel slow. To properly eat you have to take your time. You must savor, not gulp. And isn’t relishing your experience the whole point taking a holiday? GALLERY: Click through to see bonus pictures of people selling stuff from boats.